Katie Hall wins the Vail Pass time trial stage by 26 seconds and moved into the overall race lead. 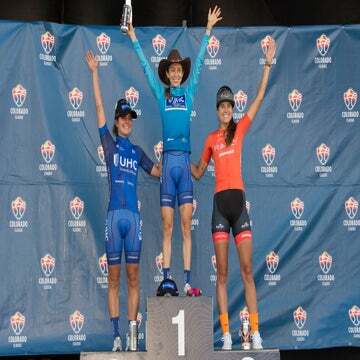 This year’s queen of American stage races took the crown Friday in Colorado Classic stage 2. Katie Hall (UnitedHealthcare) won the Vail Pass time trial stage by 26 seconds and moved into the overall race lead. Her teammate Leah Thomas was second. Rally’s Gillian Ellsay was third, 48 seconds behind. Hall has run the table in 2018, winning the Joe Martin Stage Race, Tour of the Gila, and Amgen Tour of California. The 31-year-old Californian is well-suited for the high-altitude climbing test. Stage 2’s 15.2km route topped out at 2,943 meters (9,656 feet) above sea level. She won in a time of 30:08. Hall’s strong UHC team will now work to defend the lead over the weekend in the remaining two stages. Saturday will be a flat 50-minute criterium and Sunday’s stage 4 will be a 34.8km circuit with only a slight hill.